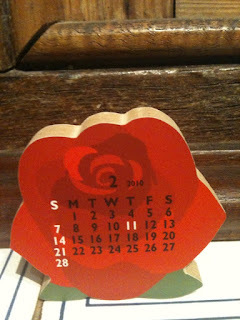 no piccies - I can't get my i-phone camera to work - and I am off to work. Another day today and probably just as hot - we are sneaking offt o breakfast at Source first - our food supplies have run out for the moment. Fabulous rugby yesterday - just got to Grant's in time to watch the Hurricanes complete a great win, saw the Blues beat the Reds and then we went to the oval to watch the Force vs Chiefs. Good game and the Force played their best game - so won't be long until they win a game. yesterday it was 42 - today a little better and the weekend expected to be hot as well for our warehouse sale - we have been setting everything up but lots of work to do tonight before tomorrow morning. 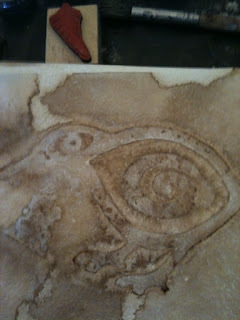 The heat makes one a little sluggish I do have to say. The Textile magazine finally appeared today - actually the bx of them was not the box sent last Monday with Fastway - I would not recommend these people to carry anything of mine around Australia - this box Down Under had to express post to us last night. Fastway in Perth don't even answer their phone and the head office simply told us there were issues. I dreamt the man had died and the box of mags was buried with him. Anyway they are all on their way to their new homes now so hope you all enjoy reading. I have a few spares for the people who asked us to bring them to the warehouse sale tomorrow - don't forget - 77 Bulwer Street. We were going to take the tinfoil down from the windows but it keeps the building cool so don't panic if you see a building all silvered up. Bruce and Kazuko sent me an early birthday present - thanks you two - very much appreciated. 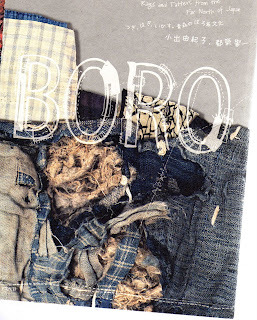 It is BORO - rags and tatters from the far north of Japan - a fabulous book especially for anyone interested in recycling and old rags and stitch. and talking of silver - I have been working on my next on-line workshop 'Gilding the Lily' and playing with foils today and I made a wonderful discovery using thread. 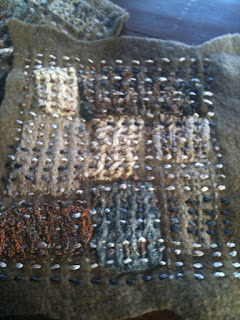 The sample is very hard to see and scan but very exciting - hand stitch stuff too. Elizabeth - swimming is wonderful - I am going every week day before the school swimming stuff - only doing 10 laps so far - that's 500 metres. i hope to build back up to 20 laps. 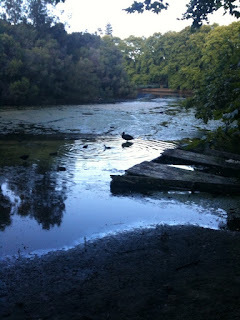 Just plodding along through the water until I feel happy enough and then increase my speed. Go for it - I had forgotten just how good it is. Went for my swim this morning which was lovely so pleased to be back in my swim routine. Only 2 lanes available though as the school swimming carnivales are on but I got in and out before them. Swimming is a great place to sort the day and more in your head while you swim up and down. I shall increase by 2 laps each day until I am back to where I was when I last went. 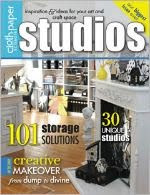 Very busy today because the Studios magazine finally arrived. Quite a good issue but I never know why, when we are the distributors, that ours take so long to get here. Anyway it is here, it is a good issue and our price is very good - anyone wanting it, there are a few left. We only bring in what we have pre-ordered for all of our mags and just a few more for the people who forget to order. 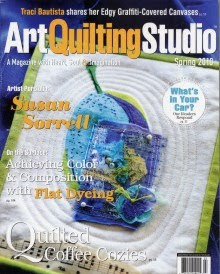 We sent them all out tonight along with the Art Quilting Studio mag. Also forgot to add the other day that while I couldn't watch, I did follow the Hurricanes on my i-phone and of course they won. Yeah! 2nd on the ladder. I did get into my studio but mainly to turn the aircon on and do a little work for a magazine article with a coming up very soon deadline. 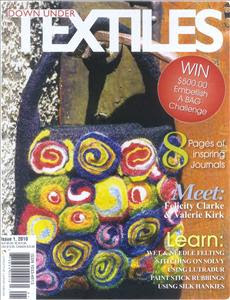 The downunder textile magazine did NOT arrive today so I am a bit miffed about where they are - tomorrow for sure. They will all be gone before they get here. I got an advance copy last week before we went to Sydney but I sold it today to someone who came especially for it. I will be interested to hear what people think of it - email me if you have any strong views. I do believe they are working on Issue 2. What did come today was the Art Quilting Studio - you can see it on our website - all the ones on order will go out tomorrow - there are about 4 extra other than the orders if anyone is chasing one. We won't be bringing in any more. It's a good magazine - this is the third issue - we still have a few of the second left and Ian has reduced the price a little to clear them. Getting ready for our warehouse sale - it is going to be hot on the weekend but our warehouse is not too bad early in the morning if that helps. There is plenty of parking near 77 Bulwer Street. When I got home I had 360 emails to deal with but have to say that the i-phone is the most wonderful thing - who would have thought I could be standing on on a ferry on the harbour waiting for a yacht race to start and reading and answering my emails? Amazing. Sure beats internet cafes and outrageous hotel connection charges. And look what greeted us when we arrived. 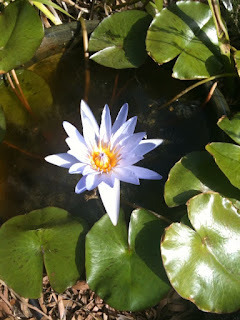 Actually all 3 of the waterlilies were out - how exciting - but by the time I got to take a pic 2 had gone to bed. but so exciting to see the errant one appear. Back home to work - the Textile mags will be here tomorrow and we will send them out along with all the other goodies missed today although we did quite well considering we got back early afternoon. At 7am good old Qantas phoned to tell us the plane was full (we used points for business class) and we could either move back to economy or go on the later flight - we fussed around so much that they must have found some other people to shove off the plane. So we got the right flight but lost our window seats and by the time they got to Ian the food choices had vanished. I have to say I would never pay money to fly business class Qantas - the food was awful going over and awful coming back. Same soggy beans and carrots I have rejected in economy many a time. Today's racing n Sydney was postponed - the weather can't have been right but here is SLAM at the attempted start. 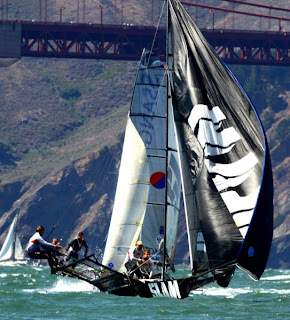 Tomorrow Ian and I are flying off to Sydney to watch the remainder of the regatta - my shopping day on Friday will be curtailed as today's race is scheduled for then. But that doesn't matter - the racing is what we are going for. It will be a family outing - Annette and Terry and Ken and Raylene are coming over from NZ - all those Rollies together at once. We are all going out for dinner on Friday night. Watch out Sydney. We will be back on Monday morning. 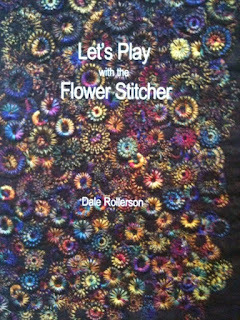 See you on Monday and by the way - visit the website, go to notions in the catalogue and check out our first little video on the flower stitcher - this is an introduction - I have plans to load a number of short videos on using the foot (red headed blondes have short attention span) - let us know what you think. Next one I will actually fit it for you! Yes indeed the little shelter is about mouse-size but you have to admit it is colourful and no I am not going to make one 5ft high, Helen. Our weather is still nasty and sticky but I do believe the precious doctor has arrived with a breeze so we can relax outside for a while. Here are a few pages from my new journal - I am playing with the sprays and stamping into them while they are wet and I really like this effect. 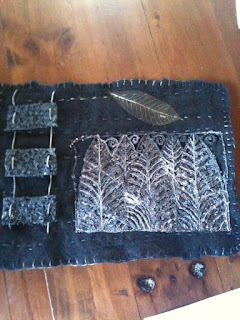 I shall work onto these pages with pen and stitch but it my 2010 project. I have gilded this kiwi - apart from difficulty getting the glue off (you must do it straight away) it worked really well. 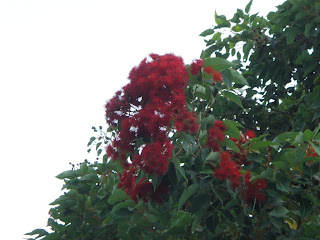 and this is another eucalyptus in our front garden - it has lovely flowers and they burst out of little reddy coloured buds - you can see them on the tree - lots of people pick them up when they go by. The leaves on this tree are the ones I usually take to Ally Pally to give away. When there is moisture in the air they smell wonderful - so fresh and citrusy. 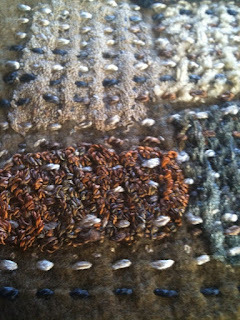 For everyone waiting for the Down Under Textile magazine - I thought they were being sent last week but it turns out they left today by Aussie post so they won't be here until Monday next week - we will post them as soon as they arrive - I have now got some coming for everyone who emailed and ordered and a few extra as well. Great start for the Hurricanes in the rugby although we thought they were done at half time. But not a good start for the Force - it was great having the game just a hop and a spit away but only hope they do better next game here in a fortnight. 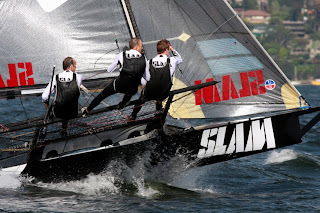 The 18ft Skiff Worlds start today on Sydney Harbour - good luck to SLAM. If you are on the harbour look out for him - you can't miss that wonderful spinnaker. first game is the Hurricanes vs Blues - go the Hurricanes! 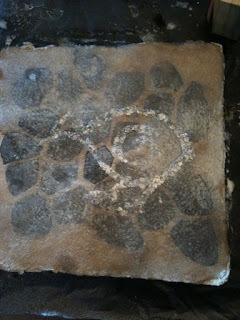 Having been inspired by Kathy Kerstetter's art jounal using the stencils (you can see her beautiful work on the website in the Stylish Spencils section), I have been playing around with the stencils some more - this is the cosmic bubbles which I have sprayed onto khadi paper and then turned the stencil over and pressed down for the residue to imprint the negative. I like the result of this one very much. I used starburst sprays black orchid silver as I do and of course my fingers were pretty grubby looking when I went out to dinner with Val and Jim last night. 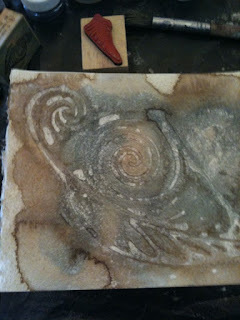 Then I sprayed onto some Stonehaven silk noil - like the effect. 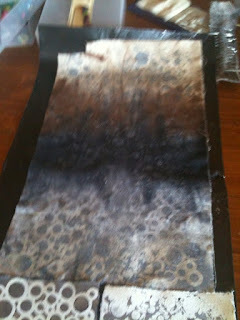 The fabric is actually black in the middle but the sprays leave a lovely mica effect. Thanks to Maggie, I had to buy the apps Type drawing for my i-phone - lots of fun - I could play with this whilst hanging around at airports and other dreary places! 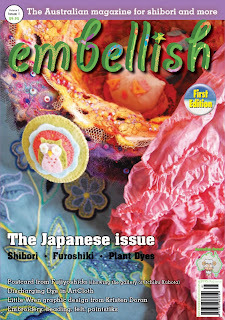 Excitement for 2010 - two new textile magazines made downunder. 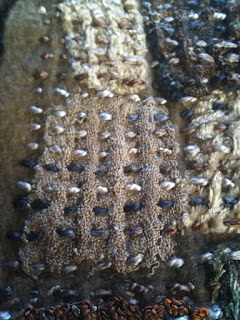 The above one is Downundertextiles which is just leaving Sydney for here today and Embellish which will launch on 1st March. We will load them to the website this week. (Ian has a big job coming up to add all the new Cottage Garden threads). Both will sell for $9.95 plus whatever the postage is depending ont he weight - we only charge actual post. We already have an number of pre-orders for both mags but do email if you want to be added to the list. 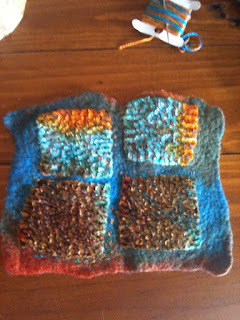 I believe that Textiles will not be sold through newsagents (at this stage anyway). It's exciting to see this happening - when I started The Thread Studio in 1996 I made the comment many times that such a publication was needed. 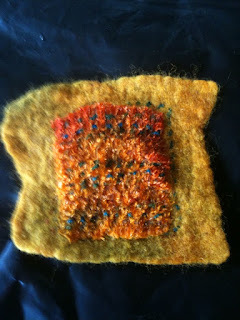 Machine Embroidery (and textile art) started off really well and I got very excited but then it changed and hasn't really got back on track. It caters for a different audience although I do send in my wacky stuff from time to time. I have also suggested a magazine to Ian from time to time but he has always rolled his eyes in absolute horror and I must agree with him that we have more than enough on our plate. In fact I am in the process of dreaming up something new and exciting but I haven't told him yet. Even better - we had rainlettes this morning - these are tiny drops of misty rain which made the electricity wires crackle as the dust came to life. 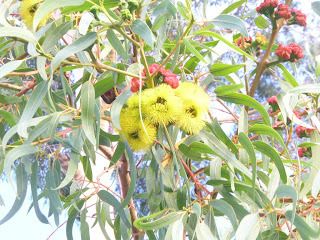 All gone quickly but it has cleared the air and you could smell the fresh eucalyptis leaves. May it last and not be humid. Thanks for the comments on the yapppy little dogs - Ev - I have the town of Vincent ranger - dog info sheet and they do say they will do something - whatever that may be - I haven't phoned them yet although I can hear them. The guy isn't even there half the time but the dogs are. 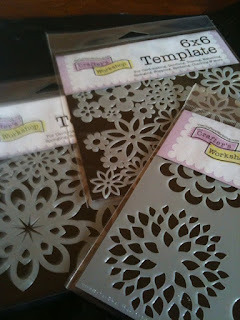 A new set of Stylish Stencils arrived yesterday - it is exciting opening all these parcels. 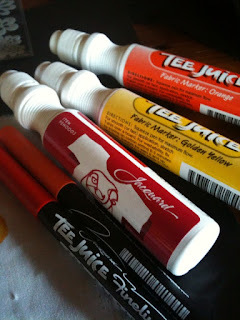 I thought I would have a play with them and Tee Juice pens. 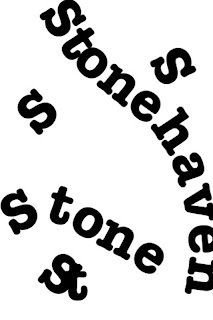 Ian was so efficient he got all the new stencils on the web before I had time to play with them. I have been diligently tidying the studio - ho ho - well just cleared the centre of the big table so I have a large surface to work on but I am proud to announce that I did clear it again at the end of the day. 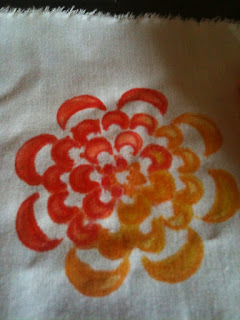 This is the Mums stencil - on Khadi rag paper - using Tee Juice pens - the fat ones rubbed over the stencil and outlined with the fine ones. 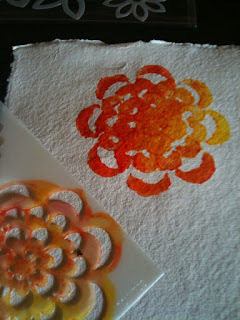 I know they are designed for fabric but I thought I would test them out on such textured paper. Then I tried them on polycotton - really like the effect. So easy to use - and you just heat set with an iron. Last night we went to Cantina 663 for a wonderful dinner - the food is so lovely and we felt we had been working hard. I spent the first hour of the day at the warehouse doing more work - nearly there. Julie - the Cottage Garden threads are Australian - this is the second lot and Pam's colour shading and blending is fantastic. Big job for Ian to get them all on the web coming up. We have been very busy today and there were loads of parcels delivered. Hadn't realised I had ordered so much stuff. 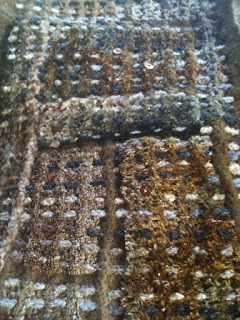 A couple more Textile Tantrums - they are slowly but surely coming in. 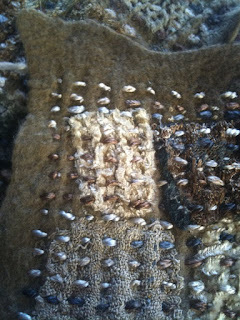 Some wonderful work which I am sure you will all love seeing. Here is a better pic of yesterday's piece. I used the busy background for something else. My Stonehaven book is growing fatter. I am also drawing and thinging on paper to make a paper book before too long. A change of colour - I have an Art to Wear piece to create before the end of March - this is a little sample - thinking Kimberley Dreaming. 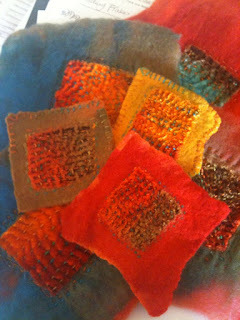 and here it is felted up - not sure how I will use them but watch this space. As usual my deadlines are short and my list is long. 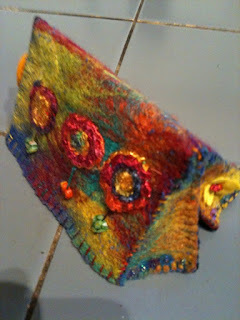 Today I sent things off to the Aust Creative Embroidery and Textile Art Magazine for a short article. Almost one down. 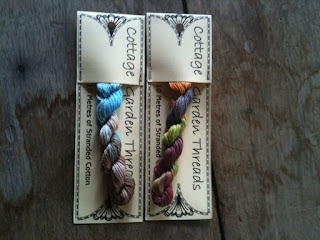 The new Cottage Garden threads arrived today - I think there are 36 new colours. Absolutely glorious. 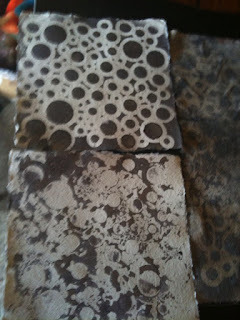 The one on the left looks like Warrandyte to me and the second has a touch of Indian Splendour. I shall look at their real names. 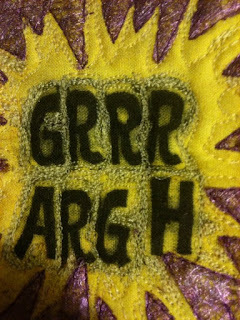 Down on the corner of our street is a house where the current dweller kicked his mother -in-law out - we have no idea where she has gone to but in her place he has 2 of those heavily irritating little dogs with high-pitched voices which bark incessantly all day. For months now. I think tomorrow is the day to phone the ranger before we all go mad or rather I go mad. not a wonderful photo I am sorry but I did take your advice thanks and create another background and finished my next page. I will post a better one tomorrow. Warehouse looking better every day - another few hours work today - for all those people who keep telling me they can't find it,Iian has popped a map on the calendar page of the website. The Treaty of Waitangi (Māori: Te Tiriti o Waitangi) is a treaty first signed on February 6, 1840, by representatives of the British Crown, and various Māori chiefs from the northern North Island of New Zealand. The Treaty established a British governor in New Zealand, recognised Māori ownership of their lands and other properties, and gave Māori the rights of British subjects. However the English and Māori language versions of the Treaty differ significantly, and so there is no consensus as to exactly what was agreed. From the British point of view, the Treaty gave Britain sovereignty over New Zealand, and gave the Governor the right to run the country; Māori seem to have had a range of understandings, many of which conflicted with the British understanding. After the initial signing at Waitangi, copies of the Treaty were taken around New Zealand and over the following months many other chiefs signed. Until the 1970s, the Treaty was generally ignored by both the courts and parliament, although it was usually depicted in New Zealand history as a generous and loving act on the part of the Crown. From at least the 1860s, Māori looked to the Treaty, with little success, for rights and remedies for land loss and unequal treatment by the state. From the late 1960s, Māori began drawing attention to breaches of the Treaty, and subsequent histories have emphasised problems with its translation. In 1975 the Waitangi Tribunal was established as a permanent commission of inquiry tasked with researching breaches of the Treaty by the Crown or its agents, and suggesting means of redress. 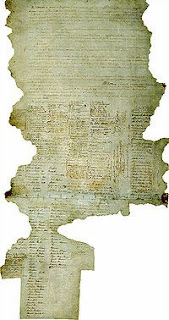 Today it is generally considered the founding document of New Zealand as a nation; despite this, the Treaty is often the subject of heated debate. Many Māori feel that the Crown did not keep its side of the bargain, and have presented evidence of this before sittings of the Tribunal, despite a contrary view from some in the non-Māori population that Māori pay too much attention to the Treaty and use it to claim 'special privileges'. The Crown is in most cases not obliged to give effect to the recommendations of the Tribunal, but nonetheless in many instances has accepted that it breached the Treaty and its principles. Settlements to date have consisted of hundreds of millions of dollars in money and assets, as well as apologies. Well the Force won but they certainly didn't play the Mooloos - that is in 3 weeks time when the real games are underway. They beat the Qld Reds very comfortably and our bbq was good as well. Plus it took 2 mins to walk to the ground and 2 minutes to walk home again. 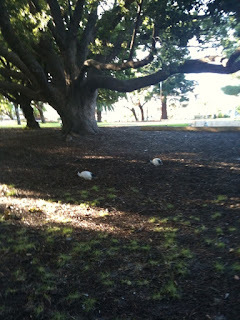 Here is Hyde Park in the morning - a swan in the top picture and some other birds int he bottom one. it is such a lovely park to walk in. There are exercise stations everywhere - had sore legs after pedalling away on at one station. Thanks for the comments about my background. 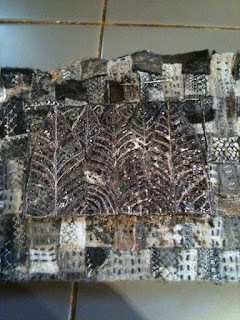 It was some of my dry felt stitched and woven but I shall make a new less busy background for my leaves. Very soon. This morning is another marathon few hours in the warehouse cleaning up for our first ever warehouse sale on 27th and 28th Feb. I have been playing with tortured tiles today and tortured myself by leaning on and breaking the glass plate I use with the soldering iron. I also made a background for my disintegrating leaves from the forest floor. It might be too busy and I might make another. Then I made a list of all the things I have quite soon deadlines for and that exhausted me. 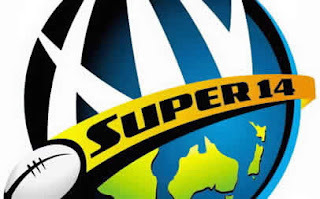 However Ian has lit the bbq because tonight is the final pre-season match for Super 14 - yes folks - it's that time of the year again. The Force are playing the Chiefs - the Mooloos - at our very own park which is just 3 steps away. Instead of sitting in the garden and listening to a loud concert we can be at the game. It's February and I forgot my special month from Kazuko and Bruce. Sitting in the studio. Last night we went to Koinonia and Anthony cooked us a beautiful fresh NZ flounder. Didn't have my i-phone to take a pic but it was wonderful. Always makes me homesick. I think NZ flounder is one of my favourites (although I did like that Dover Sole at Muswell Hill). When I was little we had flounder quite a lot. I don't think NZers ate much fish back then. If you had fish 'n chips it was shark and that was only for a special occasion if I recall. We had pipis which we got at the beach and toheroas but I wasn't mad on them. I don't recall eating much white fish. I think my mother always thought they looked rather old and tired(they probably were). 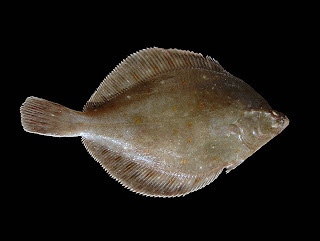 I think people gave flounder to my father as we often had it. Yummy. My other special love was NZ whitebait. I used to bike to the beach with my net and stuff and I am pretty sure the blokes at the river mouth were especially kind to me 'cos I always came home with some. We had wonderful whitebait in NZ last trip and if you go to Lau's Family Kitchen in St Kilda they have the most glroious NZ whitebait dish. Anthony served it with a grapefruit, cucumber and chilly sauce. has just arrived from the printer. How exciting. Be on the website very soon. We spent most of our weekend at our warehouse stacking, unpacking boxes and cleaning up. It is a wonderful feeling when you achieve quite a bit and while there is still a lot more to do, it is a very satisfying start. We hope to be ready in a week and then we can really stand back and admire the hard work. More about that in the newsletter which is in Ian's capable hands and will be sent out some time today. 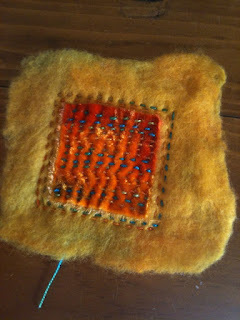 In the meantime I am a little errant with Holey Moley but working on that - I diverted over the weekend with some dry felting, layering, stitching and embellishing. ABove is the piece from the other day which has now been run under the embellisher - it integrates the whole piece much more. 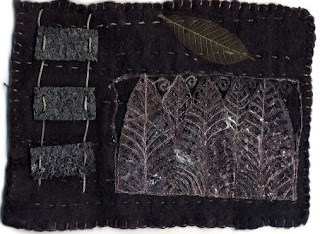 Below - the piece stitched in thick silk thread but not embellished - you can see the thread sits on the top and I like it when it is integrated and becomes part of the work.